As a superior tasting pepper jelly, the inaccurately named Heine Hurtin’ Hot Sauce is neither a “hot sauce” nor is it “heine hurtin'”, but it IS extremely delicious! Pour this pepper jelly over a block of cream cheese, serve with your favorite crackers, and you have an instant spicy appetizer or snack, and you’ll be the hit of the next holiday party. We could stop right there. Simple enough. It’s a great pepper jelly with a mild jalapeño kick. But here’s a little back-story I’d like to share with you. I’ve been a fan of Heine Hurtin’ since it came on the market way back in 1998. Originally created by Carin Froehlich of Ingleby Farms in rural Bucks County, PA, Heine Hurtin’ was Carin’s grandmother’s original recipe. 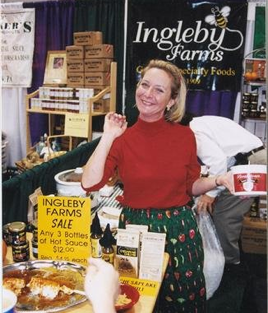 It was also the first product from the now defunct Ingleby Farms that would expand to over 27 other family recipes, including a Jalapeño Ketchup that is still available today. 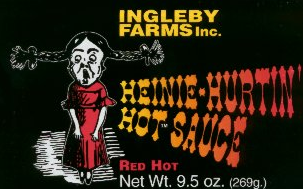 Heine Hurtin’ Hot Sauce won a 1st Place Scovie Award in 1998, as well as numerous other awards during it’s first few years on the market. 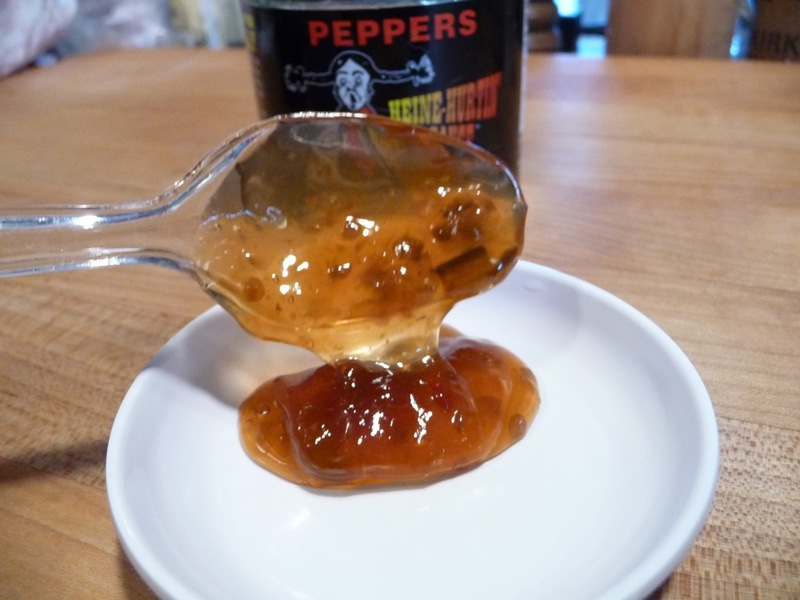 All hot sauce lovers should have a jar of pepper jelly on hand for a quick dip and appetizer. For me, I always keep Heine Hurtin’ Hot Sauce around to pour over a block of softened cream cheese for a quick dip with crackers. An exciting combo of sweet & hot, this sauce is extremely good served on the side with chicken, pork or lamb. Add to eggs, hamburgers, hot dogs – serve alone as a fabulous pretzel dip. Be creative! Makes the world’s easiest hors d’oeuvre by taking a brick of cream cheese, pour jar of hot sauce over the cream cheese, serve with crackers of your choice. I’ve tried other pepper jellies, but they just don’t measure up. I buy Heine Hurtin‘ by the case! I’ve glazed our MOINK Balls with this jelly, and I’ve heard from Curt McAdams (@cmcadams on Twitter) that pepper jelly is great glazed on ribs near the end of cooking. We take Heine Hurtin’ to all parties – and on cream cheese with crackers, it disappears within minutes. Overall Rating: – Our top rating! 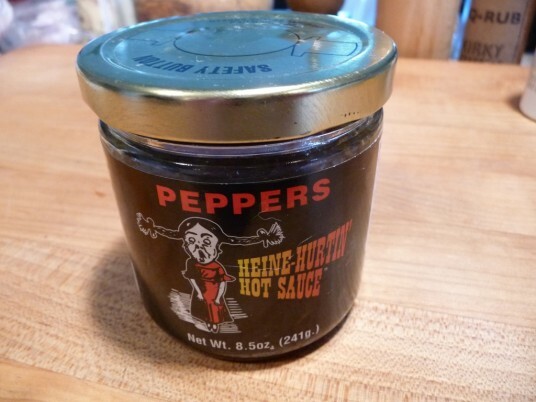 You can buy Heine Hurtin’ Hot Sauce directly from Peppers.com. Let us know if you’ve tried Heine Hurtin’ and what you think of it, compared to Three Monks, Braswell’s, Stonewall Kitchen or even Tabasco’s (which I’ve not had in years). Are you a fan of pepper jelly? I’m a big fan of pepper jelly and love it over cream cheese. Thanks for the review of this one .. sounds good enough to mail order if I can’t find it. @Lea Ann – Something I should have mentioned in the review is that Heine Hurtin’ ‘s consistency is very pourable when at room temp. Not gloppy like some other jellys. And after it is refrigerated, it will thicken up like any other jelly, but is quickly brought to room temp and pourable again. Looks lovely. Haven’t tried tried particular pepper jelly or ‘chilli jam’ as we call it here in Ireland, but I love it with mature cheddar & poppy seed crackers. I love a great cheddar but have never tried it with a pepper jelly/jam. Thanks for the idea. It’s a delicious combination – enjoy! I’m liking Curt’s idea as I’ve often cut BBQ sauce with cherry jelly. A spicy version would be more my liking. I learn something everyday. And I’ve certainly thought about cutting some BBQ sauces that are just too much on their own. Chris, thanks for the tip, it’s genius. i LOVE this stuff! especially in grilled cheese sammiches: couple of slices of bacon, one slice of american cheese, 1 oz of cream cheese, and don’t forget the sauce in the middle. sososo good!